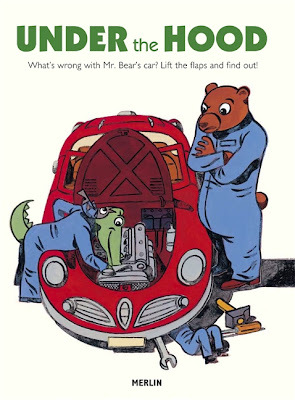 It's long been a reliable trope of picture book to switch back and forth between the reality of a child's world and how that child's imagination is perceiving and transforming that reality. Where the Wild Things Are leaps to mind, of course, but the most gifted of our modern illustrators are also doing great things with the concept, from the stripped-down simplicity of Antonia Portis's Not a Stick to the fabulous controlled chaos of Suzy Lee's Shadow. British illustrator Owen Davey's Night Knight, like Sendak's classic, leads off with reality but soon (in fact, sooner, in this case) lets imagination take over. 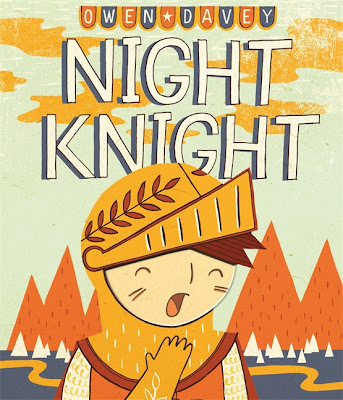 A boy in pajamas with a colander on his head informs us that his nightly bedtime ritual is "a great adventure"—and then, on the next page, transforms into a boy knight, complete with chain mail and helmet. The boy is right: His trip down the hallway on a white horse takes him past an inconspicuous telephone table and umbrella stand and through a leafy forest; his bath explodes with colorful fish and crabs (and a giant bath plug); his "climb into bed" involves a tall tower and a ladder. The author cleverly slips an element or two of the boy's reality--the mundane hallway furniture, the bath plug, the dog collar on the boy's pet three-headed dragon to whom he says good night—into each step of the process. But to concentrate too much on that would be to make too little of the book's most truly wondrous aspect: Davey's resplendent, vivacious illustrations of the imaginary stuff. This is an illustrator whose panels will make adults gasp. They'll also keep young children coming back to Night Knight night after, well, night. "In the Moment" will be a short running list of each of my sons' favorites of the moment—books, songs, toys, movies, what have you, their passions of the day. I was playing with silly names for each of their lists, but when I started seriously thinking about using the horrible Harry Potter pun "Griff Adores" for his list, I backed away from the language games slowly. Like so many kids, Dash and Griff are alternately obsessive and fickle, and in unpredictable ways, so I expect that certain items may stay on the lists for months, while others flit on and back off within days. I'll certainly write full posts about many or most of the items (or will have done so already, in some cases), but the lists will provide a fuller, more comprehensive view of the stuff our family likes most than I ever have time to cover in posts. Most holiday-themed children's books, let's face it, aren't very good. Most are conceived and created mainly to be promoted at their respective times of the year, and accordingly aren't terribly inspired. And Presidents' Day would seem, if anything, an even worse holiday than usual for kids' books; the preponderance of those pegged to it that I've seen through the years have been dutifully dull marches through the cherry trees and log cabins. But two new books—one for each president, each illustrated by an artist known (among other things) for New Yorker covers—are out to change that. 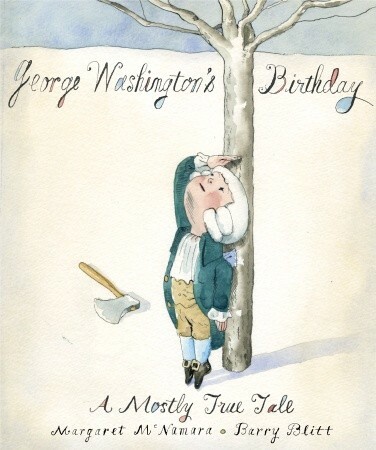 George Washington's Birthday: A Mostly True Tale, by Margaret McNamara and illustrated by Barry Blitt, is a whimsical tale of George's own seventh birthday. The authors don't exactly shy away from the hagiographic details by any means—but, borrowing a page from Blitt's sublime 2006 solo outing The 39 Apartments of Ludwig Van Beethoven, drop in little "fact" and "myth" boxes here and there to set the record straight. 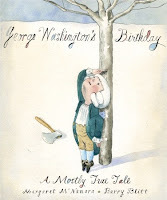 The book makes young George refreshingly human; as he becomes more and more frustrated that his entire family appears to have forgotten his birthday, he quite naturally, well, acts out a bit. Early on it's muted—muttering "I'll be the boss of you someday" under his breath to his older half-brother (who's also his teacher)—but of course it all culminates in big-time vented frustrations on that poor cherry tree. McNamara's tone is delightful throughout, just breezy enough without losing its grounding in the parts of its narrative that are based in fact, and she makes our first president more approachable and sympathetic than he appears in just about any other children's book I can think of—even the ones in which he's a child. And Blitt's trademark warped-realistic watercolors complement her text wonderfully, adding an additional and quite funny level of expressiveness to our hero. This is one of those books that slowly turns up the corners of your mouth as you read. 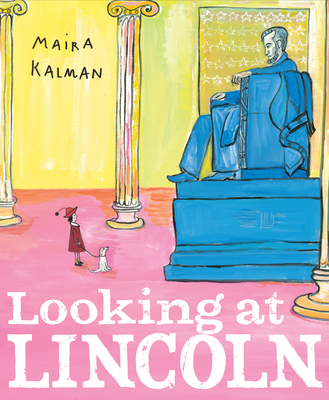 Maira Kalman's Looking at Lincoln is similarly imaginative, and even similarly whimsical, but also (as befits its subject) more pensive. In it, a child narrator takes the reader through her own investigation of the guy on the five-dollar bill (as she initially thinks of him). She hits the big historical points, of course, but it's the Kalman-ian flights of fancy that really make this book special: the girl's picturing Lincoln loving apples and vanilla cake, for instance. Actually, Kalman even lends the historical stuff this extra dimension—when it comes time to recount the president's tragic murder, she opens the scene by noting that after the horrors of war, Lincoln felt the need to laugh at something and thus went to see the fateful performance of the comedic play at Ford's Theatre. It's all presented in a somber, matter-of-fact voice that feels very true and right, both for the young narrator herself and for the children who'll be reading this book. 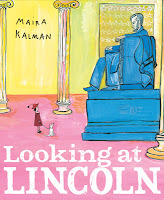 Kalman is masterful at capturing the wonder of discovery that's at the heart of all the best history—and she somehow allows even an adult reader who knows a lot about Lincoln to partake in rediscovery. Much like the book I last posted about, Zero the Hero (about to be released later this month) is a math-lesson picture book that doesn't feel anything like a lesson, because it actually tells a story. 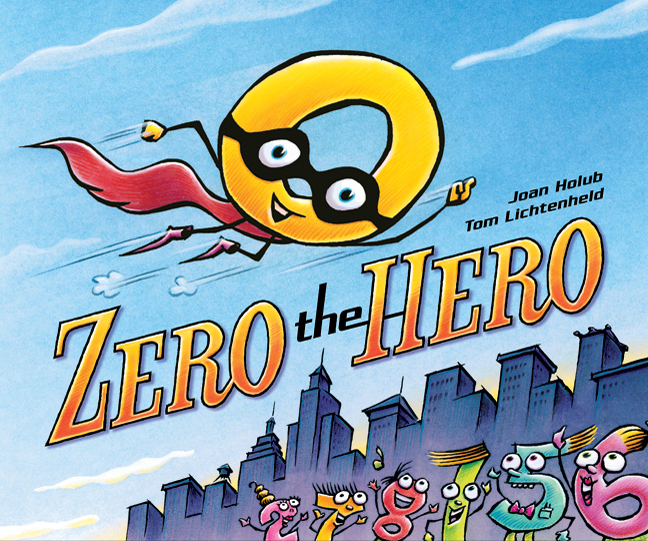 Author Joan Holub and illustrator Tom Lichtenheld (who clearly has a talent for this sort of thing, having also illustrated the similarly clever letter book E-mergency last year) make the titular digit a sympathetic outcast among the other numbers. At first he's looked down upon because he has no effect whatsoever on addition and subtraction—and then he's feared and cast out because he makes the other numbers disappear in multiplication. It's become a particular favorite of the younger one, and while I can't say how deeply the math lessons are penetrating his brain as he reads the book again and again, the exposure can't hurt. Even at this age, a lesson that doesn't feel like a lesson? Parental nirvana. Three-year-old Griffin is at the stage with books where I can hardly keep up with his current favorites—they literally seem to change every day. But there are a handful I can always rely on his continuing to ask to be read to him at bedtime. One is the oversize 2006 instant classic 365 Penguins, by the French team of Jean-Luc Fromental and Joelle Jolivet. I remember being struck by the book when it first came out—it was a favorite of Griff's older brother, Dash, back then—and thinking that it has a lot going for it. First, there's the design: huge spreads of graphic black, white, and orange, depicting an ever-growing population of penguins sent, day by day over the course of a year, to an unsuspecting nuclear family's home. There's the learning aspect: The whole book is in fact a beautifully designed series of multiplication lessons, as the family uses math to figure out the best way to efficiently house, feed, and just plain deal with their new avian companions. There's the surprise environmentalist ending, featuring the eccentric ecologist Uncle Victor and a polar bear. There's even the Where's Waldo?-esque game the author and illustrator subtly slip in, involving a single blue-footed penguin named Chilly. 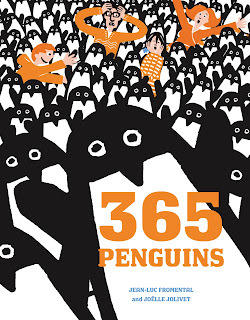 Thanks to all of that, 365 Penguins grabbed us from the start, and it's never let go. Dash still enjoys leafing through it at seven, and by the time Griff got to it, it was already on the hallowed Sendak-Dr. Seuss shelf. Which is exactly where it belongs, I think. Labels: children's books, Jean-Luc Fromental, Joelle Jolivet, math books, picture books, Security Blanket, Where's Waldo? It's not that the story is anything fancy—Mr. Bear, a mechanic, has his car break down, and must organize his rather lazy assistants, a crocodile and a mouse, to fix it. But the execution, which is usually where one finds the action in great genre books, is both clever and very aesthetically pleasing.